In the mid-to-late 1940s, Andrews was one of the most beloved, most highly-paid movie actors in the world. But how many people remember him today compared to Bogart, Peck and Fonda, or even Fred MacMurray, who attained similar heights in that era? Andrews’ steep decline fascinates Rollyson and he goes a long way towards sorting out why it happened. First, although the sudden death of his first wife when his son was 2 years old was a personal tragedy for Andrews, it helped make him a star because his family situation prevented him from being drafted during World War II. Like other actors who might have stayed second leads (e.g., John Hodiak) if some of the biggest male stars had not been serving in the military, Andrews snagged some roles in part because he remained on the home front. After the war, there was simply more competition for the kinds of parts with which he was identified. Second, Andrews was an alcoholic. He started showing up hungover on the set, or not showing up at all. He muffed lines, got into punch-ups off screen and was arrested multiple times, all of which generated bad publicity. Some of the actors and family members quoted in the book, and in my opinion Rollyson at times himself, try to soft-soap Andrews’ drinking problem but it was clearly highly destructive to him and to people around him. His nadir in this respect was probably the 1967 Eurotrash film The Cobra, in which as Rollyson notes, Andrews is visibly intoxicated on screen. A third factor that Rollyson didn’t discuss explicitly but I extrapolated from his writing is that by personality Andrews was a dutiful sort of man who was less inclined than other actors to push back against producers who tried to cast him in junky movies. Although as Bette Davis discovered — to her pain — producers were simply more powerful than even big stars, many actors found some safe wiggle room with producers when choosing projects that was not the agreeable Andrews’ nature to seek. Finally, and this is entirely my own conjecture rather than Rollyson’s, the emergence of James Dean, Marlon Brando and Montgomery Clift et al. after the war was a reflection of the public’s (at least the younger public’s) desire to see a different type of male star than the strong, silent Greatest Generation type that Andrews usually played. Maybe Andrews could have adapted to this new style of acting in some of his films, but he never got the chance. I thus see him as a terrific star for a certain type of film, but don’t know how broad his range could have been if he had recovered from alcoholism sooner and gotten more diverse and higher quality scripts from the 1950s onward. 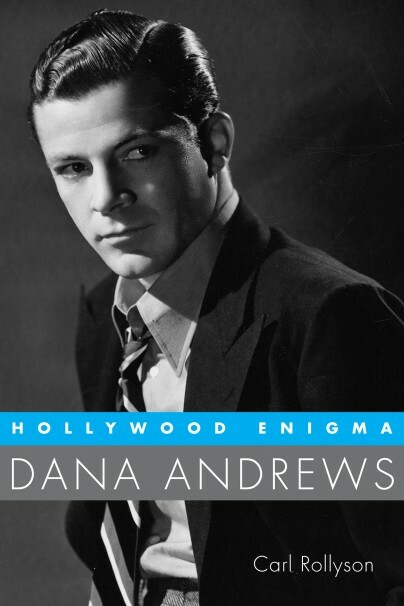 If you are a fan of Dana Andrews, or simply interested in Hollywood’s golden era generally, you will find much to enjoy in Rollyson’s book. It’s packed with an unusually high level of vivid details, yet at the same time is an easy read. I devoured it in just a few sittings. As for Andrews’ movies, I have already recommended here two from the 1950s, a decade in which he was often struggling with his drinking problem and lousy scripts, but sometimes nonetheless turned in a strong performance in a strong film. Those two were Curse of the Demon (my recommendation here) and Zero Hour! (my recommendation here, with a co-recommendation of its peerless parody, Airplane!). In the coming weeks I will review three other excellent Andrews’ films: Where the Sidewalk Ends, Canyon Passage and Boomerang!. I hope you enjoy this “April of Andrews” and take the time to rediscover the marvelous movies of this complex and fascinating actor. "Curse of the Demon" was also excellent, so thanks. And finally I learned the source of that sample in Kate Bush's "Hounds of Love." Also, too, Myrna Loy & Hoagy Carmichael. Pingback: Weekend Film Recommendation: Boomerang!